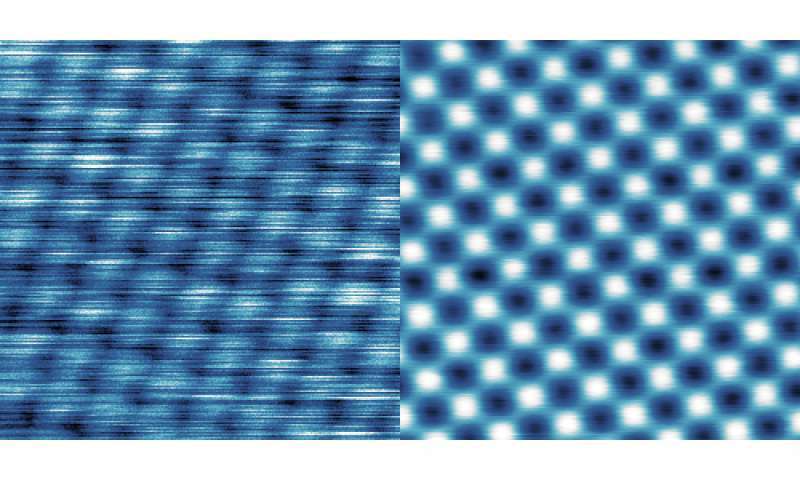 It is one of the most accurate measurement instruments available today: the high-performance microscope at the Institute of Applied Physics of TU Wien acquires images of individual atoms by moving the tip of a fine needle tip across a surface. The position of this tip must be controlled with a precision in the range of picometers, i.e., billionths of a millimeter. 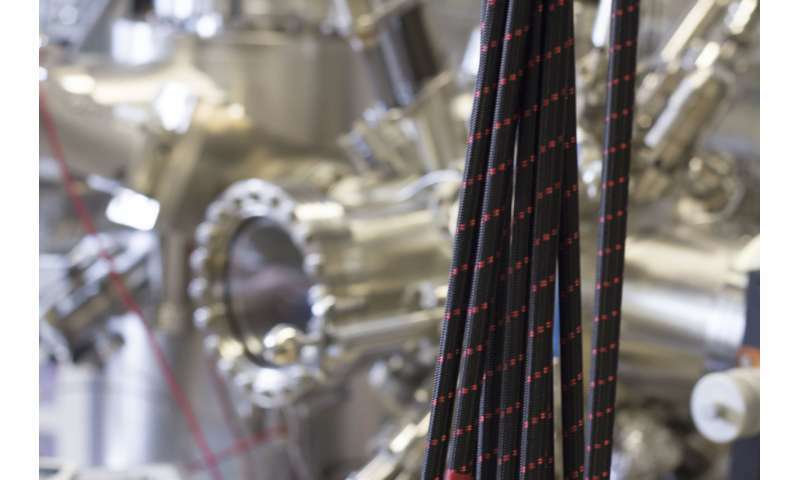 "This is akin to controlling a needle with the length of the entire diameter of the Earth to a precision of one millimeter," explains Prof. Michael Schmid from the Institute of Applied Physics at TU Wien. Any kind of vibration makes the microscope unusable, so getting the best performance out of such an instrument is a serious technical challenge. At TU Wien, this was achieved with a special setup that dampens vibrations to a very low level; even vibrations with a very low frequency, which are the most difficult to control. The entire 1 ton instrument hangs on bungee cords, and an electronic control system adjusts the suspension to keep it level. This newly developed system has now been patented. "Other research groups operate similar microscopes in separate basements, or in specially designed buildings," says Prof. Ulrike Diebold. 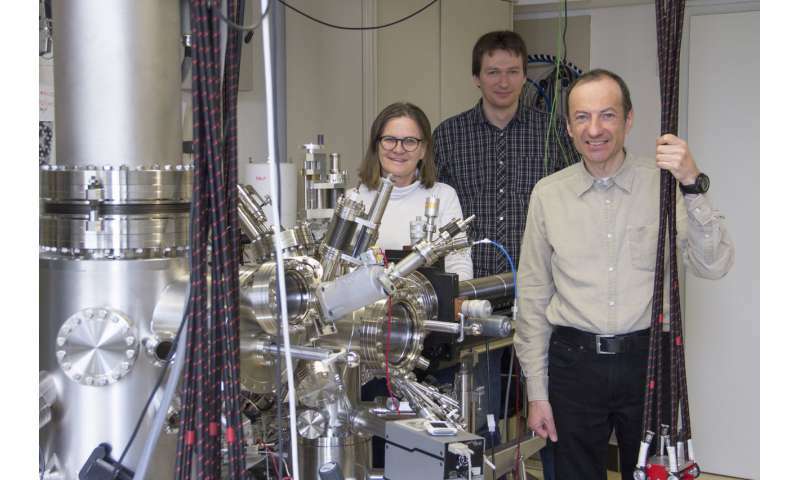 She was awarded the 2013 Wittgenstein Prize, and part of her prize money was used for purchasing this high-performance microscope that combines scanning tunneling microscopy with atomic force microscopy. "When I mention at conferences that we run our instrument in a high-rise building in the middle of Vienna, directly above the subway, colleagues are amazed." "We quickly realized that conventional vibration damping would not be enough in our case," says Michael Schmid. "Commercially available solutions filter high-frequency vibrations, but it is hard to get rid of the low frequencies." Michael Schmid first analyzed the vibrations: wind causes the building to oscillate at a frequency of a few Hertz, and the subway excites vibrations each time it passes underneath. Some genuine detective work was necessary to find, for example, the origin of a mysterious 20 Hertz vibration that was so strong it made measurements impossible—but only at certain times of the day. "It took us a while to realize that this vibration is caused by compressors in the basement that are used to liquefy helium," says Michael Schmid. The vibration problem was finally solved by suspending the microscope from the ceiling, together with its entire metal housing. It hangs on bungee cords as these have elastic properties that are particularly well suited to dampen low frequency vibrations. The cords were intertwined in a special arrangement to simultaneously dampen vibrations that come from different directions. The device floats about two millimeters above the ground, and the distance is monitored with position sensors. If the height changes, the system automatically readjusts by pulling on additional bungee cords with one of three separate electrical motors. "That's important because weight is shifting around during the experiments," explains Michael Schmid. "We use liquid nitrogen to cool our samples. When nitrogen evaporates, one part becomes lighter, but the overall construction must remain exactly horizontal." With this special suspension it was possible to exploit the full potential of the high-performance microscope, despite the unfavorable location. "The alternative would have been to search for lab space in a different building, but that would have had other disadvantages," says Ulrike Diebold. "Elsewhere we would not have easy access to liquid nitrogen and liquid helium. The infrastructure is excellent here in the Freihaus of TU Wien in the middle of the city. Just the vibration conditions are anything but optimal." Numerous measurements have been carried out with the special vibration damping and have already resulted in several scientific publications. Now the invention has been patented with the support of the research and transfer support of TU Wien. "Of course we hope that other institutions will take up our idea and also improve their results as drastically as we did," says Michael Schmid.